Fedex brought a present today. What good is a PVS-14 without a sturdy weapon mount? After quite a bit of research, somehow I ended up back at the same manufacturer I always end up with – GG&G of Arizona. I’ve yet to have a product from them that wasn’t excellent and the GGG-1016 PVS-14 mount is no exception. This is actually easier to mount than the GGG-1190 EOTech quick detach I’ve also reviewed and consists of a ring that clamps around the objective of the PVS-14 and a base that attaches to a 1913 rail system. 1. Do not push the ring all the way back on the PVS-14, or the base will hit the bump on the PVS-14 case. You will have to scoot it back out from bottomed out slightly. Experiment with the fit before tightening and you’ll see what I mean. 2. It doesn’t really matter much (since the eyepiece rotates), but the most flush fit with the flat bottom of the PVS-14 has the top part of the ring slightly off-center. It looks a little funny, but fits perfectly. 3. Make sure the the locking notch on the bottom of the ring faces forward, or it won’t lock in the base. 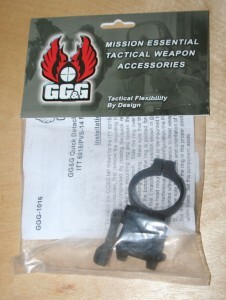 Attaching the base to the rifle is no different than attaching any other accessory. Make sure the lever is on the non-ejection port side of the rifle and clamp it down pretty close to the back of the receiver. I was pleasantly surprised to find that it doesn’t interfere with my Troy tritium pop-up rear sight even when butted completely up against it as shown in the picture. The sights flip up and work perfectly. Position the lever pointing forward, put the ring bottom into the base firmly and rotate the lever down until it locks. 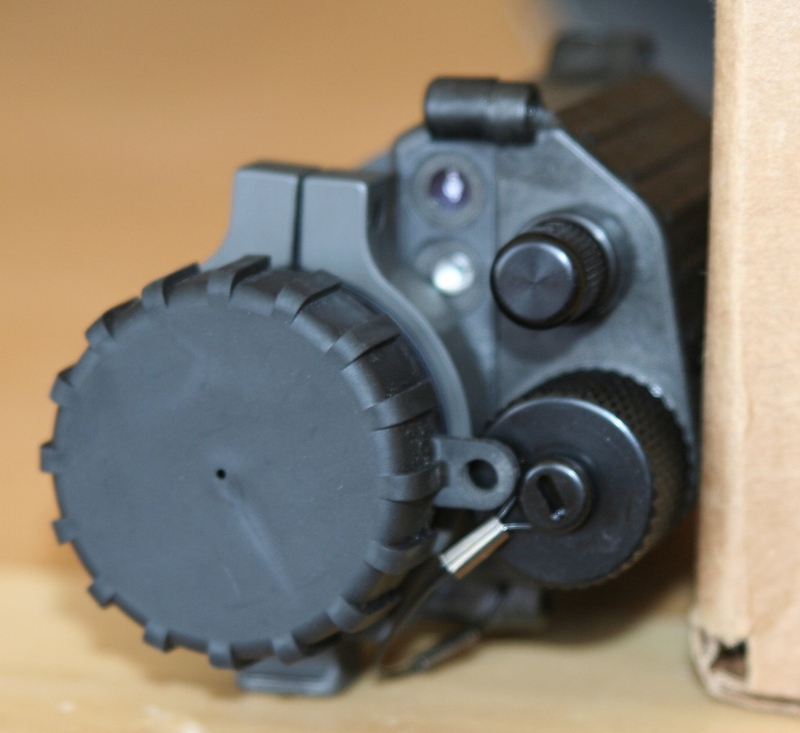 That’s it – a very simple fluid motion and your PVS-14 is firmly attached to the rifle. The mount aligns it well with the EOTech – it seems a little high, but sight picture is great. My forearm rails are canted slightly, so I can’t mount anything bridging the gap between the forearm and receiver. As a result, my EOTech is far forward and I see the ghostly outline of it through the PVS-14. Once you turn on the EOTech and flip it to night vision mode, you won’t notice the outline as your eyes are drawn to the green glowing 65 MOA ring in the middle of the scope. As usual, GG&G delivers for a price. With a $3,000 PVS-14 in potential jeopardy, the ~$220 for this mounting system didn’t bother me. 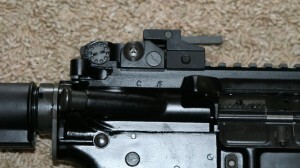 Note also that GG&G has a couple of other mounting systems for the PVS-14. 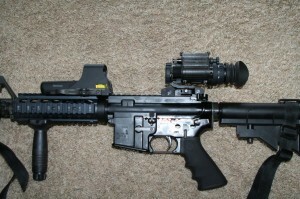 This particular one is a bit more expensive because it’s designed to allow easy transition from head to rifle. You can also look at the GGG-1340 (Aimpoint base) and the GGG-1015 (low mount). The GGG-1016 is available from Amazon for $168 with free shipping.